Mr. Mingles was rescued as a kitten from the rafters of a cabin where the kids and I were staying on a church retreat. A dog chased him up there. He watched that dog kill his kitty sibling. We never met his parents. Malnourished, dirty, and flea infested, we fed him yogurt and bacon from the dining hall until we could get him home. To this day, he sits in the kitchen every morning when I make my breakfast smoothie some can like yogurt from the spoon. As you can see, he’s more than made up for his humble beginnings. 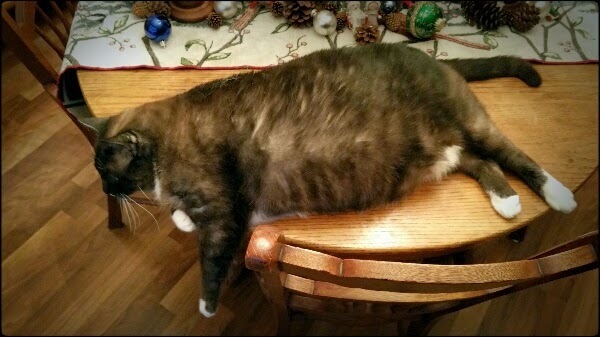 Mr. Mingles is now a fat cat. Son number one has returned from college and brought frat cat Percy home with him. While Ming gets along with Fred, our third cat and ruler of all, fat cat Ming cannot tolerate frat cat Percy. All Percy wants to do is play. Ming does not play, ever. When Percy tries to mess around, Ming responds with growls and hisses, and waddles to a spot on the couch or to his place on the dining room table (don’t worry, we never eat there). There’s a kitty door to the garaged that leads to the one of two litter boxes. Ming has to think about getting through that door due to his oversizedness. To make matters worse, Percy has made a game out of lying in wait to take advantage of the lumbersome Mr. Mingles as he squeezes himself through the door. All that is to say, Mr. Mingles can’t be bothered with using the litter box. Just before settling in for my meditation time this morning, I caught him just as he was squatting to take a wiz on the Christmas tree skirt. I quickly picked him up, morning mudra forgotten, and whisked him away to the box where he promptly peed. Fred and I discreetly waited on the other side of the door so we could praise him for his good behavior. We waited a good long time, but Mr. Mingles wasn’t going to risk the annoyance of Percy’s potential pounce. I finally broke down, open the door, and he came racing inside. I picked him up again, went back into the garage, and watched as he barley squeezed through the kitty door. Mr. Mingles needs to lose some weight. I can’t figure out how to make this happen. I carefully measure out his meals and I take up everyone’s food so there’s no free grazing. Still, he’s as large as a small child and he seems to be gaining weight. I don’t want to spend the holiday monitoring Mr. Mingles’ movements, but I also don’t want to live in a house that smells like a litter box. Why can’t we all just get along?